BIM 360 is the single cloud platform that supports informed decision-making through the project lifecycle, leading to more predictable and profitable outcomes. Connect teams and collaborate on shared designs with BIM 360, the next-generation project delivery and construction management platform. Make better decisions and eliminate costly delays with BIM 360, the next-generation project delivery and construction management platform. Autodesk brought these things together into a single BIM 360 brand that supports Design, Build and Operate. BIM 360 Docs is a building and construction document management solution, Autodesk’s project delivery and construction management platform. BIM 360 Design is a cloud worksharing, design collaboration, and data management product made for distributed and multidisciplinary teams. BIM 360 Layout app for iOS & web service provide vertical construction contractors the ability to connect the coordinated model to the field layout process. BIM 360 Plan supports lean construction practices with cloud and mobile software to help build more reliable work plans, and to help reduce waste. BIM 360 Ops is mobile-first asset and maintenance management software. It helps General Contractors deliver a better handover experience. Connect your data, your apps and your workflows with BIM 360. Work in the format that works best for you. Inform decision-making and improve project results – from design to construction to operations, from the field to the office and back. Extend Revit worksharing to project teams in any location, enabling multiple users to co-author Revit models in the cloud. Increase communication, centralise efforts of distributed teams, and let entire teams take part in the BIM process. So that the right user has the right access to the right design data at the right time. Manage 2D sheets and 3D models between teams in a central cloud location via a shared project timeline. Reduce rework with trackable project activity that is recorded for all teams, which enables transparency and ensures accountability for deadlines and milestones. Curating design data, exchanging deliverables in the project timeline, and tracking the status of shared activities enables efficient BIM management, control, and audit of project progress. Start every job with the whole team not just on the same page, but on the right page. Publish, view, markup and share comments with a single application for design review. Because the better you can see it, the better you can build it. Publish all drawing sets to a single library, control access with permission settings, view on any device and add markups, measurements and even issues to resolve constructability issues. Coordinating designers and trades no longer needs to be a process. Automate BIM coordination processes to make it quicker to identify and resolve problems between disciplines, and ensure everyone contributes to the coordination process. A single library to upload all models, aggregate model viewing, version history and automatic clash detection makes sure BIM coordination happens on time, and less problems occur on the job site. Comparing differences between versions of Revit models shared between project lead and consultants during the design phase is now easier and more powerful than before. Explore shared deliverables before accepting into your team’s space to understand how new design information will impact any work in progress. Navigate change information by team, project phase, or building level. The construction quality problems that cost the most are the ones that you miss. Standardise quality workflows gain visibility into all project issues, and quickly assign and resolve those issues. A simple checklist builder makes sure your whole team is maintaining your quality standards, and an elegant mobile experience — on Android or iOS — makes executing checklists and resolving issues an experience every worker can adopt. Safety risks increase when you don’t know what to look out for. Get safety program checklists and site observations into everyone’s hands to avoid safety blind spots. Communicate safety standards to workers in the field by publishing safety checklists to mobile devices to execute inspections, and easily raise issues to resolve any problem areas to avoid risky situations. Don’t let problems slow you down. Identify issues in the context of designs, assign work, and track issue resolution through inspection and completion. All from a phone or tablet. Put context around issue resolution with the ability to pin an issue to any 2D or 3D design location, collaborate with comment threads, add photos, assign work and track resolution through inspection. The information you need is more accessible when it is all in one place. Create, manage, distribute and approve RFIs and Submittals with project controls and activity tracking. 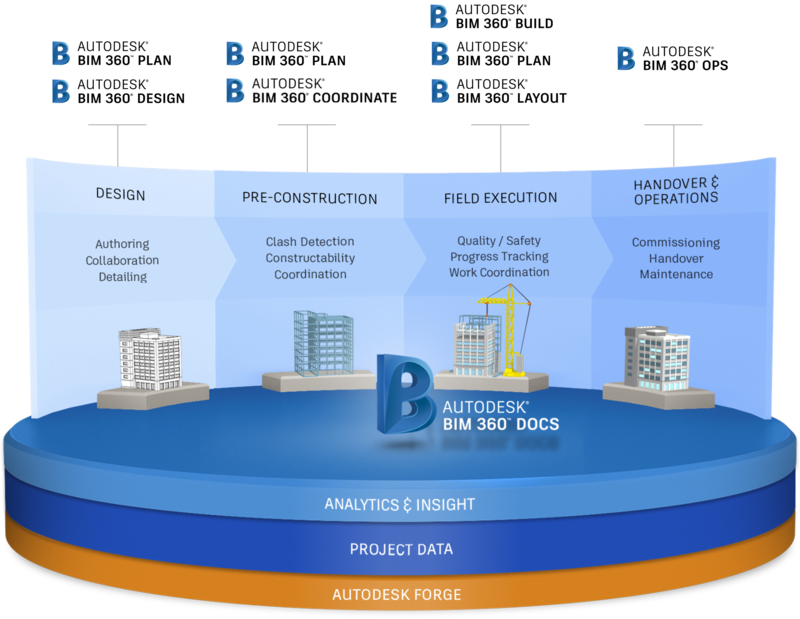 BIM 360 is Autodesk’s cloud platform for AEC project delivery and construction management that supports informed decision-making throughout the project lifecycle, helping lead to more predictable and profitable outcomes. It does this by centralising all project data in a common data platform and connecting project stakeholders and workflows – from design to construction to operations, from the field to the office and back – in a single solution. Start your projects in BIM 360 to connect your teams and data across the project lifecycle. Contact CADPRO Systems to learn more BIM 360.